People process life in different ways. Maddie Gerig choses art. Or rather, art choses her. “I couldn’t really imagine my life without making art,” says Gerig, a senior art major and writing minor. “People make art for different reasons… I make art to process what has happened in my day.” Through her multi-media artwork, using primarily clay and steel, Gerig reflects on relationships and daily interactions. The term Gerig uses for this idea is “gesture.” In art, a gesture is the concept of capturing a glimpse of someone or something, collecting and recreating their essence. This is why Maddie makes art. She admits that art is an obsession for her, and her involvement in art at college has reflected this trend. Over the course of her time at Goshen, she was president of the Art Club for three years, Best of Show winner at the 2016 Juried Art Show (as well as a winner in three other categories), organizer of the student art sale and intern with six different ceramic artists across four different states. In the fall of 2015, Goshen College’s business department awarded Gerig a venture grant, which allowed her to start marketing her multimedia art as a business. While Gerig was in the business department’s entrepreneurship class, her culminating project was to create a business plan which she presented and resulted in the grant. Her plan involved two major components: making functional ceramic pieces for businesses and creating fine art pieces. Gerig has used this grant to further establish her business, and as a result, you can find Gerig’s ceramic pieces throughout the broader Goshen community. Her work can be found at Constant Spring, the Electric Brew, Maple City Market, Rachel’s Bread (now Anna’s Bread), Found and Just Goods in South Bend. Although Gerig has spent much of her time and energy bolstering her business by creating functional pieces, she has found it quite difficult to break even making solely functional art. People aren’t willing to pay a high price for functional pottery, like a mug, in the same way as they would for a fine art piece. Currently Gerig is enjoying being a student and having the opportunity to buy clay through the school at a reduced price as well as having access to the school’s wide range of quality glazes. Gerig praised the improvements that have been made in the art department in the past year, and in the ceramics lab specifically. “The kiln yard got cleaned out, we got new studio tools, there’s no asbestos…a big shout out to Ken Newbold for that.” That being said, she would like to see further growth happen with the art department. As a senior, Gerig is looking forward to being done with college and putting all of her energy into her art. 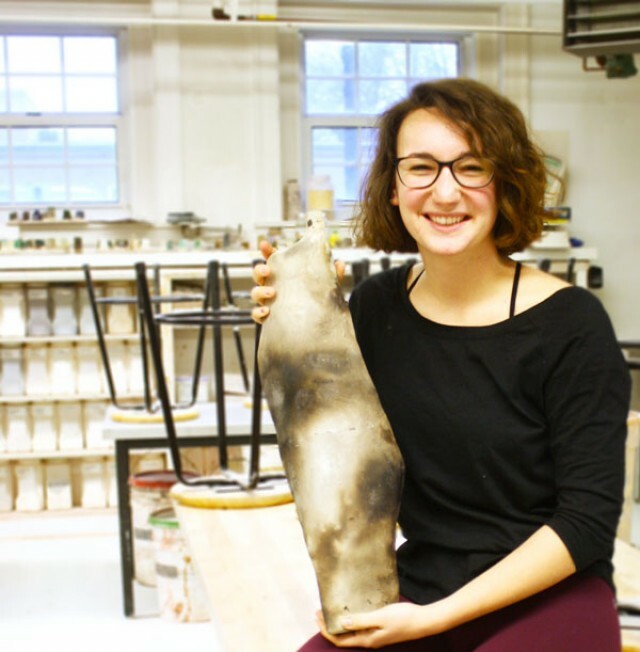 She is currently compiling artistic portfolios and is looking at a couple potential options, including graduate school and an artist-in-residence program at a clay guild. Whatever she chooses, she hopes that her art can contribute to a better society.